The band has had a very successful Christmas period fundraising throughout the Abergavenny area. Despite several days lost to the bad weather, this important time of the year saw the band raise substantial funds from carol playing and concerts. Band Chairman, Andrew Richards comments " this is a vital part of our annual fundraising calendar and money raised during Christmas will ensure sustainability throughout 2011. The Band wishes to thanks all the people of the town and surrounding area for such tremendous support again this year". The band starts rehearsals in eanest on January 4th in preparation for another busy year of contesting and concerts. We would be particularly pleased to see new players especially on cornet or Tuba. Please go to our enquiry page (click here) if you would like to join us. The band enjoyed a full house on Saturday 11th December at the Borough Theatre, Abergavenny. Joined on stage by the Junior band and the Gilwern Primary School Choir, the band treated the audience to a varied programme of Christmas music under the direction of Dave Griffiths (Musical Director). The junior band performed beautifully under the leadership of Lana Tingay giving renditions of Jingle Bells, Rudolph, Frosty the Snowman and finishing with a rousing "We Wish You a Merry Christmas". Gilwern School Choir thrilled us all with their singing and recorder playing. the Choir's repetoire comprised Walking in a Winter Wonderland, Christmas Spirituals, Here Comes Santa, and for the second half Las Heras Beguine, Christmas Ditty featuring Lucy Barrell, Ashleigh Paton, Tomos Brace-Jenkins and Grace Walters and finishing with We Wish You All a Merry Christmas. The senior bands programme included solos from the new Principal Cornet, Glen Philp who played a beautiful rendition of "I'd Rather Have Jesus", and "Merry Christmas Darlin" again beautifully performed by Euphonium player and joint young player of the year, Christan Dullea. The entire concert was admirably "glued together" by the first class compering skills of former band member and trombonist, David Hayward. The Band is pleased to announce that, following reconfiguration of the Cornet Section, it has been able to add to it's strength by appointing Glen Philp as Principal Cornet. included Cornwall’s Open Slow Melody Champion 2001 and winning Cornwall’s Concerto Championships in 2006 performing the Denis Wright’s Cornet Concerto alongside the St Austell Band under the direction of Russell Grey. 2002 saw Glen record his first solo CD album. Glen is about to embark upon his 4th year as a music student at The Royal Welsh College of Music, Cardiff. After what seems an eternity with out taking a prize at competition the Band celebrated with new Musical Director, Dave Griffiths, after taking 3rd prize in the Championship section at Ammanford on 2nd October 2010. Abergavenny were just one point behind second placed Pontardulais (188 pts) who played Diversions on a Bass Theme. 1st Place went to BTM (191 pts) who played Les Preludes. Abergavenny played Trittico and has worked hard with Dave Griffiths over the last few weeks rehearsing for the competition. Adjudicator, Steve Sykes, commented on some superb soloists and rich ensemble playing. He congratulated the Musical Director on a well organised and shaped performance. Band Chairman, Andrew Richards, comments that the Band hasn't been so well prepared for a contest in a long time. He congratulates everyone on a job well done and looks forward to the next challenge, Les Preludes in Blaenavon on Nov 20th. September 11th 2010 saw the Abergavenny Borough Bands Annual Dinner held at the King of Prussia, Abergavenny. The evening was well attended but sadly we missed the towns’ Mayor who was away on council business. Also absent was Band President Mr Ray Hill, probably the first dinner he’s missed since becoming band president. The Chairman thanked the Band members for their support and forbearance during the difficult time we've had without a musical Director and formally welcomed Dave Griffiths, our new MD to the Band. The Chairman also noted the contribution to the band made by former MD, Gareth Ritter and the innovation and imagination he brought to our performances. 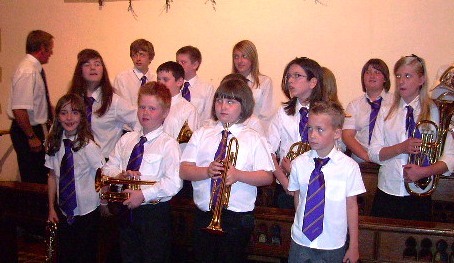 The Chairman also paid tribute to the Junior band and the marvellous work and progress it has been making. We were also very pleased to welcome some of the parents of the Junior Band to the dinner and also one of our adult learners. Dave Griffiths also thanked the Band members for choosing him as their new MD. He looks forward to working with the band and already appreciated the standard of playing and the work individuals are putting into the next test piece. Dave also complimented the Band on the way the organisation is managed and looks to the future with confidence and is certain we have success in our sights. 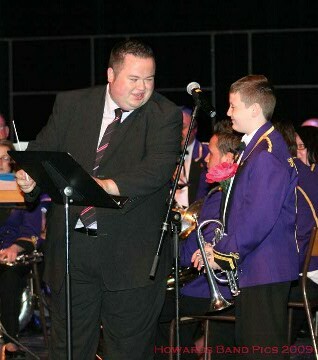 Gareth Havard, Band Secretary, thanked Lana Tingay for the hard work she put into the Bands trip to Menorca this year. This was indeed a memorable and successful event for the band and one which took an enormous amount of time and effort to organise. There were three awards on the evening. Bandsman of the year (voted for by the band members) was awarded to Lana Tingay. Young Player of the year was shared between Evan Roberts and Christian Dullea. The Band was also pleased to acknowledge Jacqui Llewellyn’s 30 years service to the Band with a long service award. On a more humorous note, Gareth Havard took us back to the trip to Menorca and gave some awards to members who made a unique contribution to our time on the island; Jaqui Llewellyn’s prowess in late night tumbling in the hotel bar was recognised with the “Only Fools & Horses Bar Diving Award, The Aldous family received the “Sky Fit for Life Award” for their VERY early morning starts and fitness routines, and Sharon Havard’s athletic backward plunge into the freezing deep end of the hotel pool (fully clothed and assisted by some band members) was duly recognised with the “Tom Daly Assisted Diving Cup”. The Band is pleased to announce that Heather McDown will be joining us as Principal Euphonium following a succesful audition at Abergavenny on 7th September. Heather is currently a postgraduate euphonium student at the Royal Welsh College of Music and Drama, and plays solo euphonium with the Ynyshir Band. She has also played 1st baritone with the RWCMD Band. The players were extreemely impressed with her musical ability and quality of playing at the audition and look forward to her starting rehearsals on 14th September as the band prepares for its next contest. Heather will play for the Band at the forthcoming Ammanford contest as a guest in order that she can still fullfil her commitment to the Ynishir Band, before registering with Abergavenny. Followng a long and difficult selection process that saw nine possible candidates reduced to a final two, the Band decided on 3rd August to invite Dave Griffiths to accept the position of Musical Director. David was delighted to accept and will be taking his first rehearsal on 10th August. click here for Dave's full biography. Dave's thoughts on his new role, "I wish to build on the good work already laid by my predecessor and friend, Gareth Ritter. I look forward to introducing new and challenging music to the band and thus, to continue to create entertaining and enterprising concerts, along with building on the recent success and accomplishments on the contest platform, where the local community and band can feel justly proud". Band Chairman, Andrew Richards, comments, "The Band was very pleased that so many were interested in the position of MD. It proved quite a challenge reaching a final decision but we all believe we have a bright and successful future working with Dave. We look forward to concerts and contests with eager anticipation. The Band would like to thank all the candidates for their interest, and I would like to thank the band members for their patience and understanding during this time". At its annual concert on Saturday 26th June the band said a fond goodbye to Principal Euphonium player Jason Harris and his wife Karen, 2nd Cornet. With work commitments it has become more and more difficult this year for both to devote the time and effort they would like to the band, and with a young family this is even more of a challenge. With over 40 years service btween them the Band gratefully acknowledged their tremendous contribution, paying tribute and thanking them both at the Annual Concert in Abergavenny's Borough Theatre. Abergavenny was extremely well represented at the 5th Annual Gwent Solos, Quartets and Ensembles contest held in Newport on Saturday 5 June. The event attracted young musicians from as far afield as Cornwall, Sandhurst and Crewe. The adjudicators for the day were Helen and Glyn Williams from the Fodens Band. The solos section provided some very tough competition with most of the podium positions again being taken by visitors from outside the Gwent region. Although Evan Roberts was our only solo medallist, gaining third place in the age 12 &13 slow melody section, we are very proud of the impressive performances put in by all our young players. In the 11 and under section Abergavenny provided half the entrants! We look forward to next year when these youngsters will be so much more experienced and targeting the top places. It was in the afternoon session that Abergavenny really came into its own. Our quartet, Only Brass R Loud, played an excellent programme to take first place ahead of The Railway Children from Severn Tunnel Band. Well done to Evan, Emily, Anna and Bethan. Then it was time for our larger ensembles to take the stage, taking both first and second places in the 15-and-under section with pieces ranging from Old MacDonald to Tequila, including some suitably enthusiastic vocal work. Our open ensemble also played very well to finish as runner up to a much more experienced group from Usk Band. Congratulations to all who took part. This was the biggest entry so far from our band and we are delighted to have played such a big part in the event. Also a huge thank you to all the parents who made it possible for the young people to be there and for their ongoing support. The Band is sad to report that its MD, Gareth Ritter, has decided to resign. Gareth has been with the band for over two years and has definitely raised the standard of playing since his appointment. Gareth says that he needs to concentrate more on professional career matters as well as needing some more personal time. His busy schedule needed to be looked at and he came to the conclusion that “something had to go”. Regrettably he came to the difficult decision that it was time to call it a day with Abergavenny. He has made many friends in the Band and will be greatly missed. Band Chairman, Andrew Richards, says “it has been an extraordinary journey since Gareth joined us. He has worked extremely hard for the band and has been very innovative in his approach to concerts and developing the youth band. The Band has benefitted enormously from his time with us and we all wish him well for the future”. Gareth has kindly agreed to continue with the Band for the forthcoming Ebbw Vale and Weston Super Mare contests. The Band played in a tiny church, at two parades on Good Friday and Easter Sunday, on a cruise around Mahon harbour on a glass bottomed catamaran, on an island and at a private house where lemons and oranges grew in the orchard. A total of 46 players, family members and supporters of the Band left Abergavenny to fly to Menorca in the Balearic Islands during the Easter break. After the flight the band’s first concert was the very next day at the Santa Margarita Anglican church in Es Castell. On Good Friday the Band participated in the sombre Procession of the Holy Burial which takes place around the centre of Mahon. Departing from the Santa Maria Church at 8pm, all the Brotherhoods of the local churches walked to pay their respects. A dozen or more magnificent shrines were carried by the Brotherhood of the different churches, including one of Jesus on the cross and a weeping Mary Madeleine, the grieving disciples, and Jesus in his coffin followed by his mourning mother Mary. The uniformed members of the Brotherhood are identified by the colours of their robes and walker’s heads are covered by triangular hoods. These hoods are worn as a sign of mourning for the suffering of Christ. The widows from each church walk behind their church elders barefoot and dress all in black. The worshipers from the Santa Maria Church are seen as the most senior in the parade, and they proceeded to music provided by the Abergavenny Borough Band. Thousands of local people lined the 2.4 kilometres of the route in silence as the procession passed by. When the procession returned approximately three hours later, The Bishop of Menorca Monsignor Salvador Gimenzez Valls delivered a short message and prayers to the assembled crowd. The next day was an opportunity for the band to sight see around the Island, followed by an early evening concert on the Don Juan catamaran as it sailed around the harbour. This sort of open deck concert was a first for the band and all ticket sales went towards charity. Come Easter Sunday and it was an early start for the Band as they were leading the procession. The Easter Sunday Procession, known as the Procession of Glory, started from the Santa Maria church. It was a jubilant event in true celebration of the Resurrection. In total contrast to Good Friday where the faces were covered, they were now smiling, happy ones, and the atmosphere was electric. The next day the Band again took to the water to travel on a glass bottom boat to the Isla del Rey - The site of a Napoleonic hospital used up until the late 1960’s as the only hospital for the whole of Mahon. The site is currently under restoration by volunteers and the band played a free open air concert to a large extremely appreciative audience of several hundred people who clearly enjoyed the concert rewarding the band with a standing ovation and generous donations to the restoration work. This was a very successful trip for the band and players and family members took the opportunity to enjoy each others company in the warm sunshine on the Island. It was particularly pleasing to see all the children of the band families having such a marvellous time together. The Band will be the first from Walee to visit the Island of Menorca and plans to participate in several events over the Easter festival. 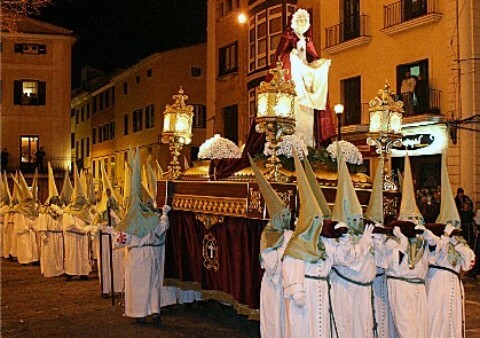 On Good Friday there will be an evening procession from the Santa Maria Church (the procession of the Holy Burial) where all the brotherhoods from local churches will walk to the music of the Band to pay their respects. Hundreds of local people will line the 2.4 kilometres of the route in silence as the procession passes by. On Easter Sunday morning we will play for the Procession of Glory and again hundreds of local people will line the route for what will be a more jubilant and happy occasion. The Band will also perform at other concerts during their stay on the Island.